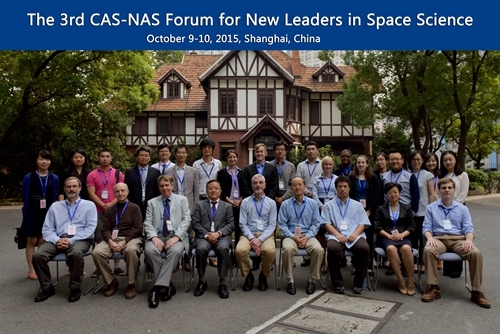 On 9th Oct. the 3rd CAS-NAS Forum for New Leaders in Space Science officially kicked off in Shanghai, aiming to promote the communications and exchanges between the young scientists in the field of planetary science and earth science in the US and China. The forum is sponsored by Bureau of International Cooperation, Chinese Academy of Sciences and is jointly organized by the National Space Science Center of the Chinese Academy of Sciences (NSSC, CAS) and the Space Studies Board of the National Academy of Sciences Engineering and Medicine, (SSB, NAS), with support from Chinese Academy of Sciences Shanghai Branch. ZHU Zhiyuan, President of Chinese Academy of Science Shanghai Branch, attended the meeting and delivered a welcome speech touching upon the promising future of cooperation in the field of space science. Prof. WU Ji, Director of National Space Science Center, and Prof. Moloney, Director for Space and Aeronautics of National Academies of Sciences, Engineering and Medicine, as co-chairs of the forum, delivered speeches to all the participants. In the closing ceremony, Prof. WU Ji stressed the importance of bilateral communication in the field space science; Prof. Moloney hoped that the young scientists could form individual connections through the forum. 22 oral presentations were programmed and six invited talks were delivered by senior scientists from the US and China, including Prof. Philip Christensen from Arizona State University, Prof. Byron Tapley from University of Taxas, Prof. ZHANG Peng from National Satellite Meteorological Center of China Meteorological Administration, Prof. TIAN Feng from Tsinghua University, Prof. SHI Jiancheng from Remote Sensing and Digital Earth Institute and Prof. HUANG Chengli from Shanghai Astronomical Observatory. During the meeting, the participants discussed in detail the questions in the field of planetary bodies in the solar system and earth science from space. There are 12 participants from the US coming from SSB, JPL, SETI Institute, Arizona State University, University of Texas, California Institute of Technology, University of Chicago, University of Michigan, Massachusetts Institute of Technology and Washington University, while 20 participants from China coming from a range of research institutes under Chinese Academy of Sciences, including NSSC, Remote Sensing and Digital Earth Institute, National Astronomical Observatories, Shanghai Astronomical Observatory, as well as China University of Geosciences in Wuhan. The next forum will be hosted by SSB, NAS in Irvine, Los Angeles on 16-17 May, 2016.